I had previously made a cake for this couples child. The dad of that child emailed me a picture of an actual Betsey Johnson "Be mine" satchel and asked if I can turn that picture into a cake for his wife, it was for her surprise party! A week before the cake was due I made the handles to give it enough time to dry and harden. I colored fondant black and Rose. I rolled some of the Rose colored fondant into a small "snake" then flattened it out with rolling pin to give it the shape of the handle. Made holes on each side with a tip 21. I then rolled the black into a snake and cut into same length littler snakes. Using water as my glue, I made one into a "ring" then attached each ring through each other to form a chain. Marble is her favorite cake so I baked a half sheet marble cake the day before the cake was due. I cut the sheet into 4 equal parts once cooled. I only used 3 of the parts, stack them on top of each other using buttercream between each layer. I covered in seran wrap and froze for about an hour. Once it was pretty stiff from being frozen I carved the shape using a serrated knife. Dirty iced with buttercream and covered with my Rose colored fondant. I covered the whole cake, not individual pieces for sides, top etc. I put in the fridge for about an hour to get the fondant a little harder so it would not tear when indenting with heart shape. I used the medium Wilton heart fondant cutter to indent the heart shape all around the purse. I did not use the sharp cutting edge, I used the blunt side so it wouldn't actually cut through. Just press into fondant all around the cake. I cut pieces of Rose into the shape of the side pockets and indented with heart shape. I used water as my glue and stuck them to the sides leaving the top a bit loose. I made very thin "snakes" and using water attached as the seems of the purse. I made the top zipper but cutting a thin rectangle from white fondant and used a zigzag roller then painting gold with an edible gold paint I purchased from my local cake store. Placed on top. I cut a large heart out of my Rose for the front. I made another zipper and cut rounds our of white with my tip 21 then painted those gold. I used water to glue them to the heart. I used black buttercream to write Betseyville then attached heart to front with royal icing. I attached the handles to the cake with royal icing. I used toothpicks stuck into the back of the purse hanging half way out to rest the back handle on to support it so it wouldn't fall. The wife that this was for was amazed by her cake! 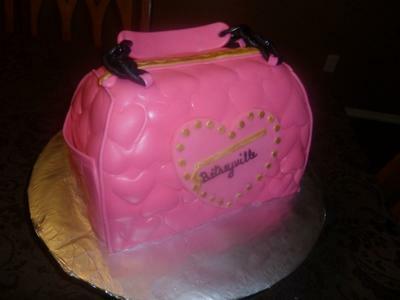 She LOVES Betsey Johnson and couldn't believe her husband surprised her with this, and couldn't believe I turned a picture of a purse into a cake!